It is official. As of 2014 consumers are now buying more handheld devices; Smart Phones, tablets and iProducts than laptops and desktop computers. Information is literally at the figure tips of consumers and they communicate, share, research and buy with the tip of their finger on the top of their touch screen device. So how can you capture the attention, engage and follow up with these tech-savvy attendees? Try adding a trade show mobile device to your sales staff arsenal. The sales apps for iPads eliminate the frustration and cost of keeping up with product changes by providing up-to-the-minute literature virtually. Traditional sales materials don’t always match the exact needs of your prospects. Sales representatives can meet with prospects at a trade show and use the iPad app for trade shows to select only the most pertinent information to email their prospect. As prospects enter your trade show exhibit, sales representatives can immediately capture their name, company, email and other pertinent information into the trade show app for iPads. Increase your accuracy and be quicker to respond to prospects with our sale apps for iPad. Managers will like the fact that you can view customer information by tablet, creating reports that are individualized by sales rep. The mobile iPad trade show app allows you to view the videos and sales material that have been distributed to prospects, leads and customers. Reporting is available to show which device has shared the most files and which files have been opened the most. The iPad app for trade shows also ensures all of your sales literature reflects your company brand. Using the app, you are able to customize reports with your company logo and colors, upload multiple files and organize by product categories. Perhaps one of the best cost saving measures for companies on a budget, is the fact that you can use the mobile iPad trade show app without connecting to the Internet during the show. A little pre-planning and loading of files, documents and videos allows you to share information and capture prospect data without connecting to your website, social media or email. Many locations are still charging an additional, sometimes quite costly, amount to access their Wi-Fi network during the event. With this mobile application you can capture prospect information and then send follow up emails once you get back to your hotel or office. For more information about our mobile iPad trade show app, give us a call. We can also help with the pre-planning process; determine the best way to customize the information so that it is customized to your company brand, organized in a way that will be easy to access during the event and how to review the data after the event. 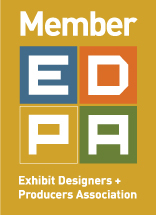 E&E Exhibit Solutions will be there – come visit us at booth#1132 and check out our touch screen interactive table technology trade show exhibit displays. Come see the changes we have made to our booth for 2015!